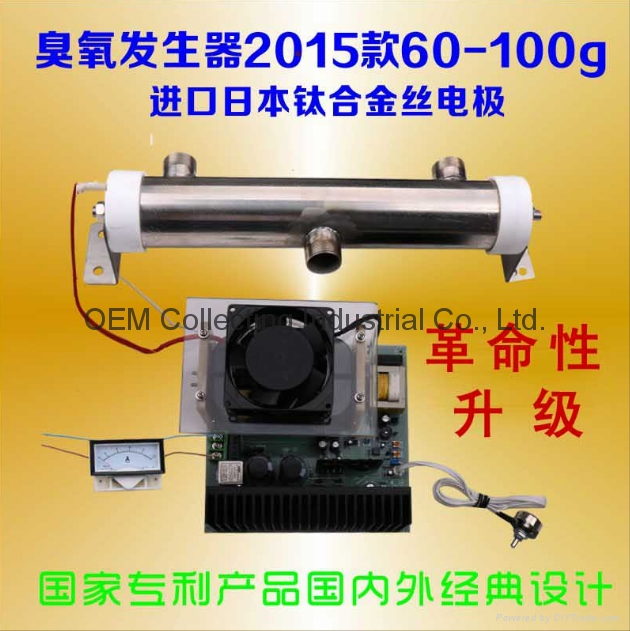 New tube-100g titanium alloy surface discharging ozone generator 2013 -100g titanium alloy surface discharging ozone generator, electrode-order quality using high-purity quartz glass. Excellent electrical insulation performance; it's about 1730 ° c softening temperature. In 1180 ° c for a long time, up to 1450 ° c maximum temperature for a short time, at room temperature, its resistance is equivalent to 100 times of ordinary glass, all frequencies of dielectric losses are minimal, insulation voltage strength. The quartz glass is an excellent insulation material, electrode 0.36 titanium alloy wire for precision winding is made. Ultimate life 130,000 hours. Electrode ¢ 32mm Center holes for water cooling or air holes. Crust is made of 304 stainless steel and PTFE finish. Ozone power IGBT power supply with negative temperature coefficient of pipe, special soft-start and soft-shutdown, concentration, frequency-adjustable, overcurrent, overvoltage, overheating and other protection. Power supply high efficiency, large concentrations of ozone, long service life. Not afraid of open circuit, short circuit, the power supply fault shutdown, fault alarm. 1, utility and tube surface discharge electrodes of titanium alloy patent products, titanium electrode used, extend life of discharge electrode, ozone for major company commitments two years or 80,000 hours. 2, create ozone gas pipe in and out of small-calibre first. 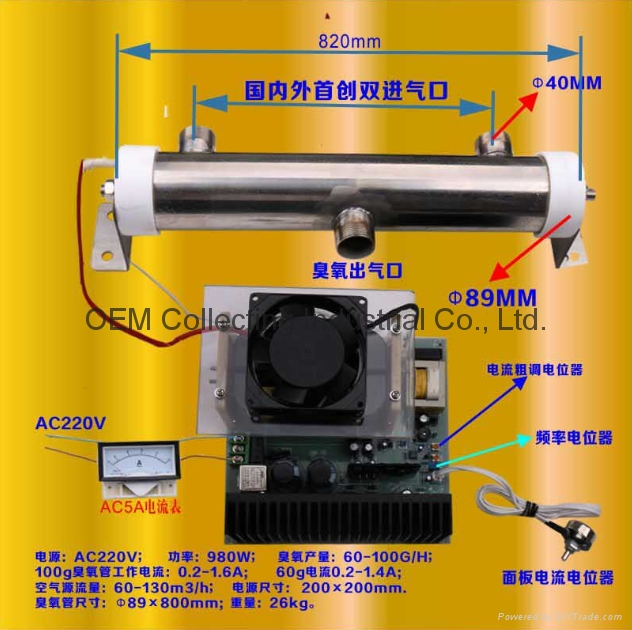 From 5mm to 50mm hole, increase airflow and reduce ozone tube working temperature. Increase ozone production. 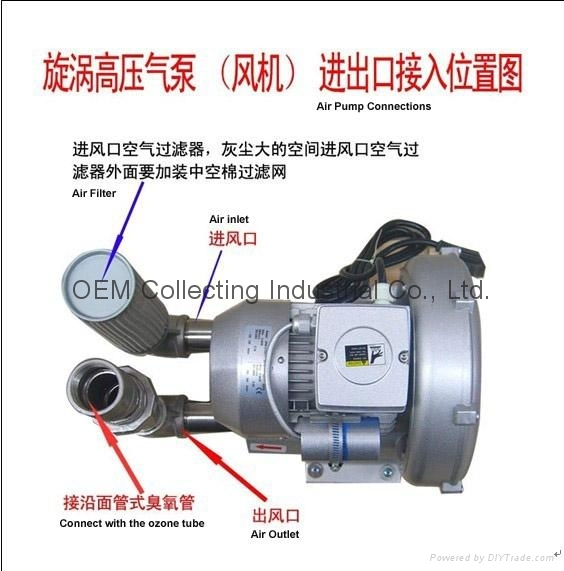 3, expand the scope of ozone generator applications. 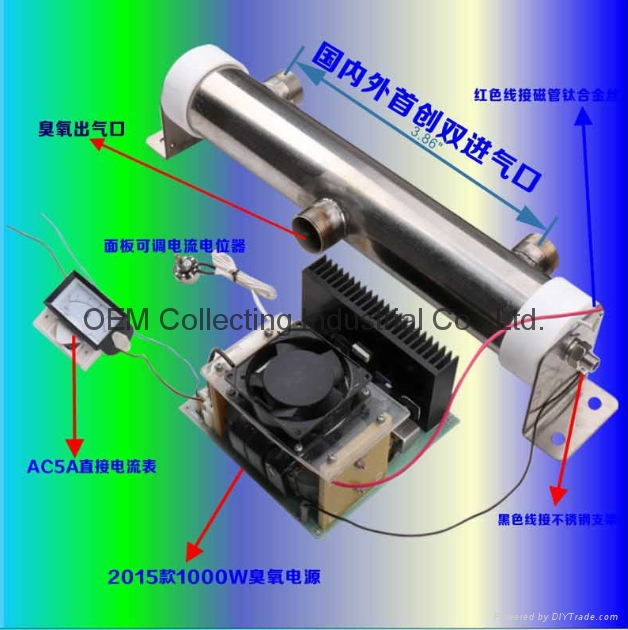 Change of ozone air disinfection using tablets, metal glass tube life disadvantages. Was livestock and poultry farming, greenhouse farming, cold storage, food processing plants, food, dairy product processing equipment, air conditioning ducts, air disinfection and sterilization and air purification products. 1, pharmaceuticals, food, entertainment, Office systems, cold storage, food processing plants, food, dairy product processing equipment sterilization. Central air conditioner room air disinfection and sterilization. 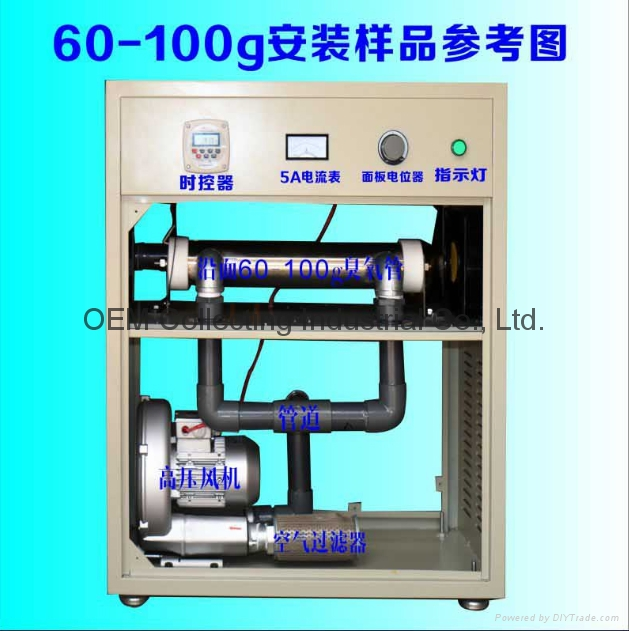 2, potable water, wastewater treatment, aquaculture, livestock water, swimming pool, bath water, mineral water, pharmaceuticals, food manufacturing, germicidal purifying water. 3, new renovated room contains large amounts of formaldehyde, toluene and other harmful remnants of paint, harmful to people, light dizziness headache, severe poisoning, most effects of ozone after new House decoration, such as formaldehyde, toluene removal of hazardous paint residue, removing cigarette smoke or other odors in the room.